If you’re a sociable or a solo traveller and want to meet other people in a welcoming, friendly environment, please read on! 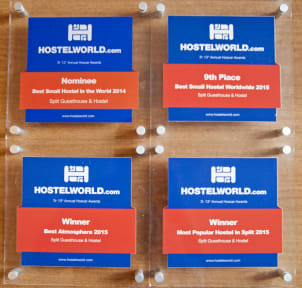 Hostelworld guests rated us the most fun property the world in 2013! There’s free padlock hire, free lockers, free use of our electronic staff safe, free Internet and Wi-Fi, free use of our Skype headsets, free towel hire and free tea and coffee – not just when you arrive, but all the time! And it’s not this European yellow label tea, either; You’re totally welcome to borrow our guidebooks for free and we have a book exchange as well. Our top-floor apartment is newly renovated and we have added our personal touches. Do you want to feel like you are staying in a social place not just a bed in a room? We've got free bed linen (who charges for that anyway?! ), plus orthopedic mattresses and air conditioning. We have a fully equipped kitchen for you to use, apart from the times when we are cooking up roast dinners, gypsy gulyas (goulash), breakfast of champions or whatever else we think the property needs to prepare for a good night out or to deal with a hangover! There’s also, no curfew and very relaxed check-out times – you can check out any time you like but you can never leave! Laundry service is available and we use an electronic entry system with a keypad and cards. Do you want to save money by taking staff recommendations for cheap places, and using the specially negotiated food and drink deals for you? Do you want to be given all the help, advice and assistance for your entire stay in Split and beyond if needs be? Do you want to be taken out by staff to cool underground places unseen on the common traveler's route? You’ve come to the right place! Do you want to meet other similarly like-minded people in a lively and social atmosphere? Do you want to go out every night on pub crawls, karaoke nights, cheap drink nights?Do you want to be given a warm welcome and a detailed introduction of the city with all the hot spots for pubs, bars, restaurants, clubs and sightseeing? Do you want to be introduced to other guests so you can instantly make friends for your travels...if not life? Split Guesthouse ('seize the night', for those who rightly gave up Latin just after it died) is the perfect hangout and base for single travelers and young, sociable people who want to be part of an interactive and lively property experience as well as maximizing the city in the day time and seizing the night when the sightseeing has ended. Sorry to inform you that from this year and due to certain events we have an age restriction for bookings. We accept bookings from guests under the age of 41 only. We are not super strict but just to let you know. Also, 24 check inn is cancelled so please follow the reception hours. After 22.00 no check in is allowed. Ambiente muito bom, me arrependi de ter reservado apenas uma noite no meu roteiro. Josko é bastante atencioso e faz ambiente do hostel ser muito bom, especialmente para quem está viajando sozinho e quer conhecer pessoas.